With the exception of Franklin Carmichael, all active members of the Group of Seven visited Western Canada from 1924 to the early 1930s. For Frederick Varley, the experience had a profound effect. Though he arrived in the West strongly identifying as a portraitist, he discovered a passion for landscape painting. Varley was not intent, however, on using landscapes to explore the Canadian identity. He called British Columbia “heaven”1 for, during his many hikes through mountains and along coastlines, he awakened to the power of nature to inform and enhance the human spirit. 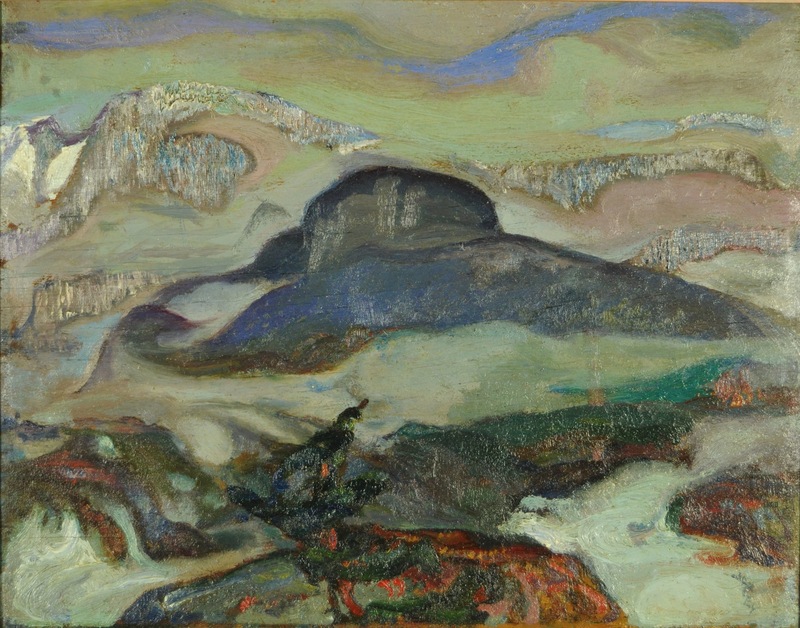 By the time he completed Mountain Peak, Varley had been living in Vancouver for three years and teaching at what is now the Emily Carr School of Art + Design. The painting’s fantastical colours, swirling forms and flattened, compressed perspective recall 19th– and early 20th-century Symbolist works by the likes of Gustave Moreau and Gustav Klimt. Varley also cited Chinese art from the 11th and 12th centuries as inspiration. In his words, those ancient artists had truly “interpreted the spirit”2 of their landscape. Unfortunately, Varley’s “heaven” was threatened in 1933. Disputing low wages, he quit his teaching post only to lose more money trying to establish a rival art school. He left Vancouver in 1937 in dire financial straits, moving first to Ottawa and then back to Toronto permanently in 1946.